This advertisement for General Radio Company's Recording Wave Analyzer caught my eye due to the chain-driven interface between the upper Type 1900-A Wave Analyzer and lower Type 1521-B Graphic Level Recorder chassis. 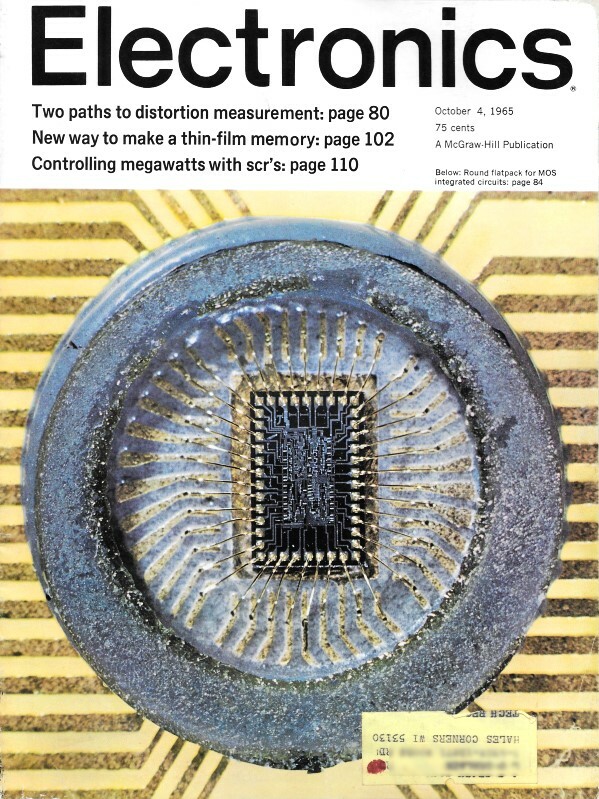 Maybe that can be considered an early form of the GPIB - General [Instruments] Physical Interface Bus. I wonder how many neckties, a rigidly-enforced item of professional dress code of the era, got caught in those exposed gears? ...or fingers for that matter? OSHA would condemn such a platform these days. It is not apparent from the photograph whether there is also an electrical interface. The quality of the printed chart output is phenomenally good for 1965 equipment - and in color, no less. I also found it interesting that a reference was made to "M. Fourier," as though maybe Fourier's first name began with an "M," but in fact his full name is Jean-Baptiste Joseph Fourier (French), so the "M." would be an abbreviated form of "Monsieur." Harmonic components of a 1-kc square wave. Analysis of a 1-ms pulse with a 20-cycle repetition rate. Graphic plot of modulation noise on a 1-kc tone for two different types of magnetic tape. Note that one tape has 10dB less noise. The Recording Analyzer is ideal for this type of measurement since its 80-dB dynamic range permits uninterrupted recording over wide ranges. • Three bandwidths let you choose the best selectivity for each measurement ... 3 c/s or 10 c/s for detailed measurements, 50 c/s for rapid analysis or for measurement of drifting signals. Bandwidth skirts are better than 80-dB down at ±25 c/s, ±80 c/s, and ±500 c/s for 3-, 10-, and 50-cycle bandwidths, respectively. 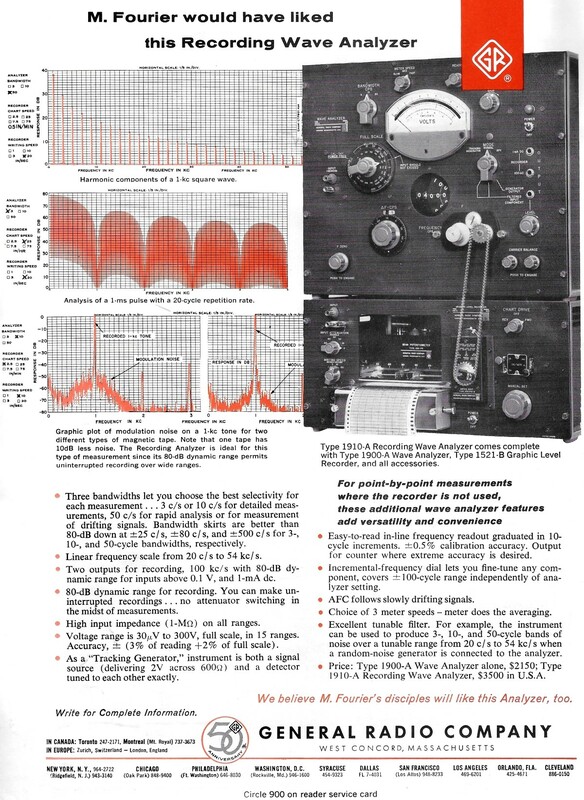 • Linear frequency scale from 20 c/s to 54 kc/s. • Two outputs for recording, 100 kc/s with 80-dB dynamic range for inputs above 0.1 V, and 1-mA dc. • 80-dB dynamic range for recording. You can make uninterrupted recordings ... no attenuator switching in the midst of measurements. • High input impedance (1-MΩ) on all ranges. • Voltage range is 30μV to 300V, full scale, in 15 ranges. Accuracy, ± (3 % of reading +2% of full scale) . • As a "Tracking Generator," instrument is both a signal source (delivering 2V across 600Ω) and a detector tuned to each other exactly. Type 1910-A Recording Wave Analyzer comes complete with Type 1900-A Wave Analyzer, Type 1521-B Graphic Level Recorder, and all accessories. • Easy-to-read in-line frequency readout graduated in 10-cycle increments. ±0.5% calibration accuracy. Output for counter where extreme accuracy is desired. • Incremental-frequency dial lets you fine-tune any component, covers ±100-cycle range independently of analyzer setting. • AFC follows slowly drifting signals. • Choice of 3 meter speeds - meter does the averaging. • Excellent tunable filter. For example, the instrument can be used to produce 3-, 10-, and 50-cycle bands of noise over a tunable range from 20 c/s to 54 kc/s when a random-noise generator is connected to the analyzer. • Price: Type 1900-A Wave Analyzer alone, $2150; Type 1910-A Recording Wave Analyzer, $3500 in U.S.A.
We believe M. Fourier's disciples will like this Analyzer, too.